ed catalytic coconut shell carbon. During this process, potentially harmful chemicals such as VOC’s, pesticides, industrial chemicals, benzene, ethyl bromide, cleaning compounds, cresol and chemicals used in fertilizers are removed. As water continues to ow through the catalytic coconut shell carbon bed, Chlorine tastes and odors are removed through adsorption, adding a “sweet” taste to your water. 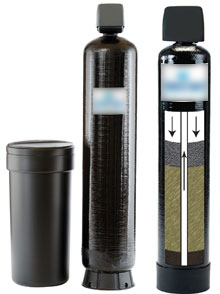 During the final treatment process, Calcium, Magnesium and other water hardness minerals are removed from your water to provide soft water for whole house water treatment and conditioning.